Merry Christmas!, originally uploaded by Temeculamom. Hi there to my wonderful blog friends. I know I have been a long lost blogger, but in between working two part time jobs (something new this year) and doing more extracurricular activities than ever with my kids, I just plain ran out of time. But I hope you all have a healthy and happy holiday season! ~ by bekaboo on December 22, 2007. Merry Christmas to you too! Love the card! 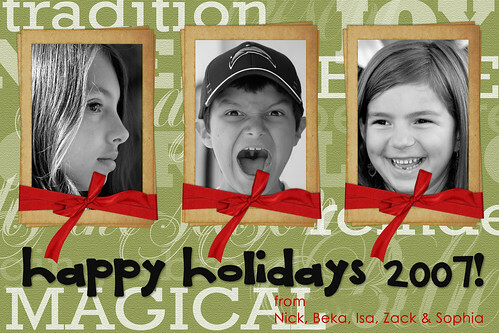 beautiful card Beka…..the pictures are priceless. I hope you had a good Christmas and New years…hope to talk to you soon.